Just How HARD Could This Be? Please don't look at my cake too carefully. 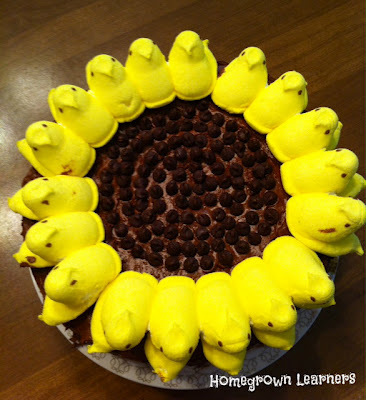 I thought the pin I saw of the Sunflower Peeps Cake was cute, and how hard could it be to make? 1. Both cakes did NOT come out of the pan neatly (I floured the pans just like I usually do, too!). 2. That's ok, because I could just "frost" them back together. 3. I frosted the cake before I put it on the cake plate. Dumb move. 4. Moving the cake from the place where it was frosted to the cake plate was HILARIOUS! I literally had to yell for my son's help (he was the only one home) to come RUNNING to my aid before the cake fell apart as I was trying to transfer it to the cake plate. 5. I'm not the neatest baker in the world. Therefore, some of the Peeps have chocolate frosting on them. This is because my seven year old son was literally BEGGING me for Peeps while I was frosting the cake. Nothing is cuter than your sweet little boy with a chocolate frosted face eating Peeps. I love that kid. So, here is my Sunflower Peeps Cake. It's cute, don't you think? The most important thing is that I loved making it for my family and I hope it makes everyone smile at Easter dinner tomorrow. Add some potato salad and rolls and we're all set. What does your family do for Easter dinner? God's blessings to you for a joyous Resurrection Day!